I grew up in the South on a farm, with a deep appreciation for our region’s natural resources, beauty and traditions. I have been a resident on Sullivan’s Island for more than a dozen years. My husband, Scott and I raised our three children here. I am deeply committed to this special community we all treasure and love. 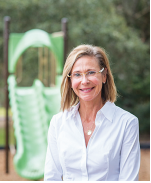 As President of the Sullivan’s Island Park Foundation for the last 10 years, I have logged thousands of volunteer hours and raised more than $100,000 for improvements to our town parks, playgrounds, tennis courts and other civic amenities. As a board member for other local area institutions, I work to improve the fiscal strength and governance of community organizations in education, healthcare and the arts. I am collaborative and results oriented. I will rely on my proven experience, work ethic and civic pride to help strategically and sensibly plan and manage our island for today and for our future. Nuts and bolts matter, especially for our growing and popular island. I will work to ensure we have clean, nonflooded roads, safe and well maintained parks and put a new lens on historic properties. Our beaches and public areas are a gift that we should be good stewards of and take pride in. As the communities around us grow, it is essential we prudently manage our financial resources. I will make sure our tax dollars are wisely spent. I will look to source other options for help with covering the cost of the impact of the growing influx of visitors. Our island has been called Mayberry by the Sea. It’s no wonder. Sullivan’s Island is special because of its people: young, old, families, longtime residents, new faces. I’ll create opportunities for us to come together as a community to share our warmth and passion for this remarkable place we get to call home. Contact Kaye Smith for more information at kayesmithforcouncil@gmail.com.